This week life went up a notch with school orientation for my son - information overload!! I decided I needed to look composed, brave and not like the other soon to be school mums. This Leona Edmiston Ruby dress in the Leaving Las Vegas print (from earlier this year) hit the spot, teamed with a pair a suede and patent leather wedge heels. 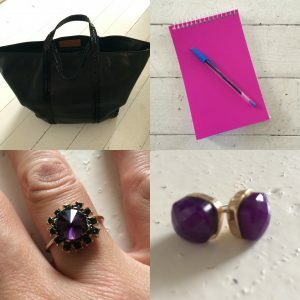 I decided to keep accessories simple and elegant opting for some purple stud earrings and a little ring these are from Lovisa. Instead of adding more colour to the outfit I went with a black leather and sequin bag by Vanessa Bruno fits lots in it, including my note pad and pen! !